Do you want to receive bonus puzzles, solution images and walkthroughs, and even e-book rewards? Become a subscriber of Grandmaster Puzzles and receive a lot more from your favorite logic puzzles site. Interested in more puzzles? Get more original puzzles at our e-book store, including “The Art of Puzzles” collection with challenges from many of the world’s best authors. Our master+ subscribers receive access to two bonus puzzles each week in addition to other rewards. 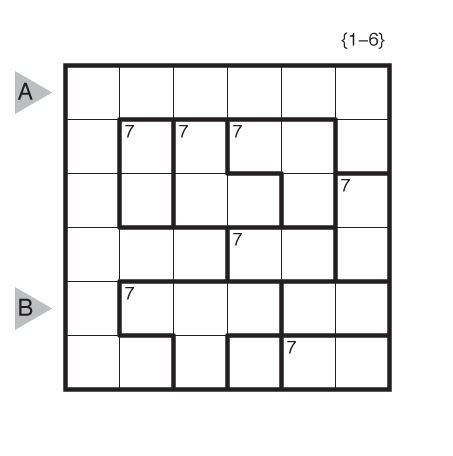 We make these posts so those supporters have a space to comment on these puzzles, mark as FAVES, or log their solving. If you are interested in subscribing and seeing these bonus puzzles, click here for more info. 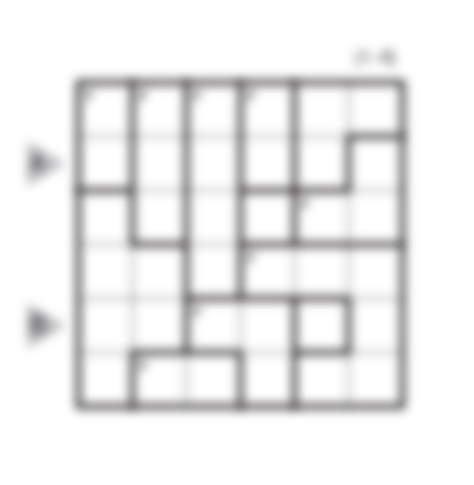 Author/Opus: This is the 140th puzzle from our contributing puzzlemaster Murat Can Tonta. Rules: Standard TomTom rules, using the integers 1-6. Answer String: Enter the 2nd row from left to right followed by the 5th row from left to right. Separate the entries with a comma. Note: Follow this link for other classic TomTom. If you are new to this puzzle type, here are our easiest TomTom to get started on. More TomTom puzzles can be found in The Art of Puzzles, and in our beginner-friendly collection Intro to GMPuzzles by Serkan Yürekli. Author/Opus: This is the 139th puzzle from our contributing puzzlemaster Murat Can Tonta. Answer String: Enter the 1st row from left to right followed by the 5th row from left to right. Separate the entries with a comma. Note: Follow this link for other TomTom. If you are new to this puzzle type, here are our easiest TomTom to get started on. More TomTom puzzles can be found in The Art of Puzzles, and in our beginner-friendly collection Intro to GMPuzzles by Serkan Yürekli. Author/Opus: This is the 138th puzzle from our contributing puzzlemaster Murat Can Tonta. Answer String: Enter the 1st row from left to right followed by the 6th row from left to right. Separate the entries with a comma. Author/Opus: This is the 137th puzzle from our contributing puzzlemaster Murat Can Tonta. Rules: Standard Star Battle rules. Two stars per row, column, and region. Answer String: For each row from top to bottom, enter the number of the first column from the left where a star appears. Enter these numbers as a single string with no separators. Note: Follow this link for other classic Star Battles. If you are new to this puzzle type, here are our easiest Star Battles to get started on. More Star Battle puzzles can be found in The Art of Puzzles and in our beginner-friendly collection Intro to GMPuzzles by Serkan Yürekli. Author/Opus: This is the 136th puzzle from our contributing puzzlemaster Murat Can Tonta. Rules: Variation of Pentominous rules. Some borders between pentominoes are already drawn. 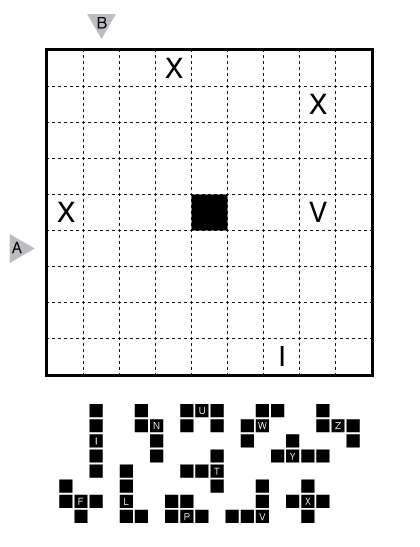 Answer String: Enter the letter associated with the pentomino occupying each cell in the marked columns from top to bottom, separating the groups with a comma. Use CAPITAL LETTERS! 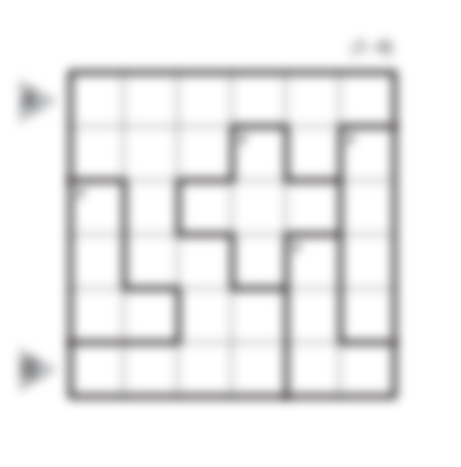 Note: Follow this link for other Pentominous puzzles. If you are new to this puzzle type, here are our easiest Pentominous to get started on. More Pentominous puzzles can be found in Plenty o’ Pentominous by Grant Fikes and Murat Can Tonta and in our beginner-friendly collection Intro to GMPuzzles by Serkan Yürekli. Author/Opus: This is the 135th puzzle from our contributing puzzlemaster Murat Can Tonta. 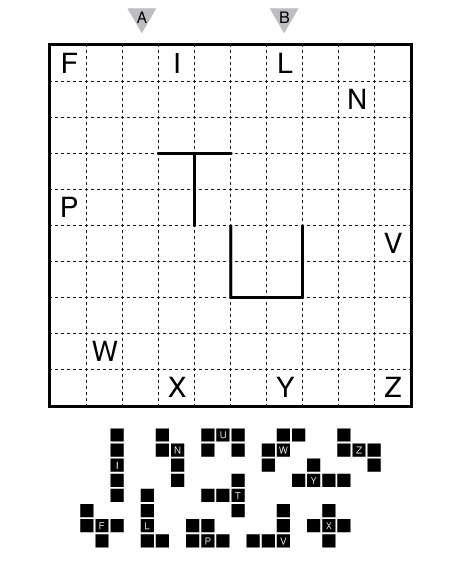 Answer String: Enter the letter associated with the pentomino occupying each cell in the marked row from left to right then in the marked column from top to bottom, separating the groups with a comma. Use CAPITAL LETTERS! Author/Opus: This is the 134th puzzle from our contributing puzzlemaster Murat Can Tonta. Label some cells with numbers to form a single connected group of labeled cells. No 2×2 group of cells may be fully labeled. Each number must be equal to the total count of labeled cells in that bold region, and all bold regions contain at least one labeled cell. The given numbers indicate how many cells are labeled in that region (but not necessarily which cells are labeled). When two numbers are orthogonally adjacent across a region boundary, the numbers must be different. Answer String: Enter the length in cells of each of the segments labeled with numbers from left to right for the marked rows, starting at the top. Separate each row’s entry from the next with a comma. 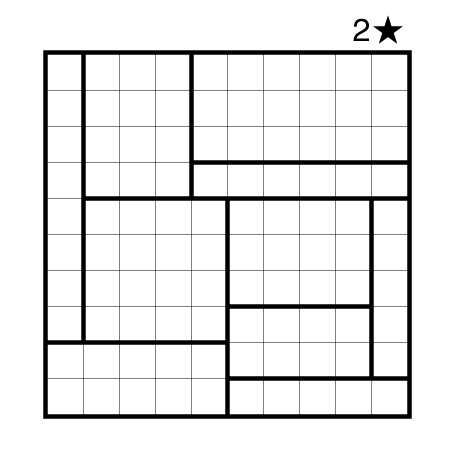 Note: Follow this link for Nanro puzzles on this website and this link for variations on Nanro puzzles. 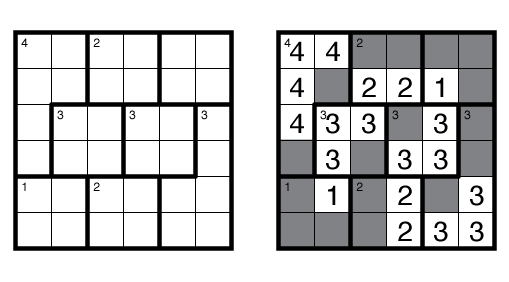 If you are new to this puzzle type, here are our easiest Nanro Puzzles to get started on. 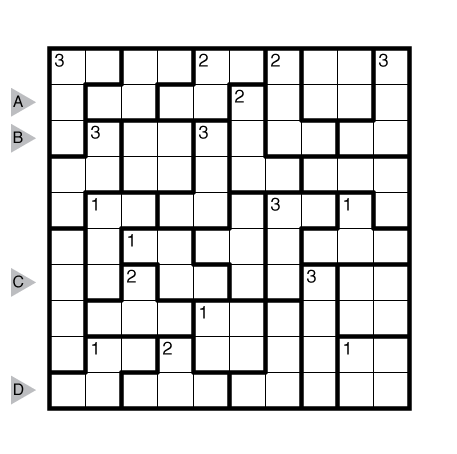 More Nanro puzzles can be found in A Number o’ Nanro by Prasanna Seshadri. © 2012-8 Grandmaster Puzzles. All rights reserved.